(KBOI2) CALDWELL, Idaho (KBOI) – A Caldwell billboard is raising questions in the Treasure Valley as it compares President Obama to accused Colorado killer, James Holmes. 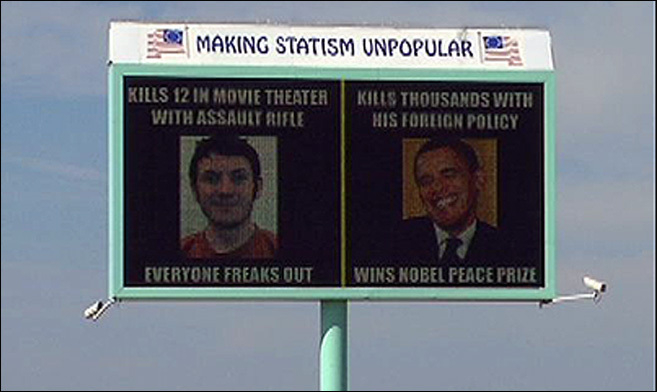 The billboard on Franklin Road equates the actions of the president’s foreign policies to the acts of Holmes, who’s suspected of killing 12 people in the theater shooting. The group that owns the board, The Ralph Smeed Foundation, says it wants to draw attention to military men and women dying overseas. “(It’s) way over the line, and I am not an Obama supporter,” Lynn Davis Hathaway, said on the KBOI 2News Facebook page. Ashley Helton, who also wrote on Facebook, agrees with the group. “It’s a free country, this group has a right to voice their opinion no matter what anyone thinks about it,” Helton said. President Obama recently visited the Pacific Northwest – making stops in Portland and Seattle.